Grab a great antivirus suite at an amazing price for three devices today at Newegg. Today’s a good day to secure three of your computers or Macs at an excellent price. Newegg is selling ESET Internet Security covering three PCs for a year for $15Remove non-product link. Newegg’s advertising the suggested retail price as $80, but buying directly from ESET would set you back $70. Either way, $15 to cover three devices for a year is an excellent price. The sale price is hidden on Newegg’s site, but adding it to your cart will reveal it. The deal ends on Thursday, February 14. ESET Internet Security is the company’s mid-tier suite, one pricing step below ESET Smart Security Premium, and right above ESET NOD32 Antivirus. 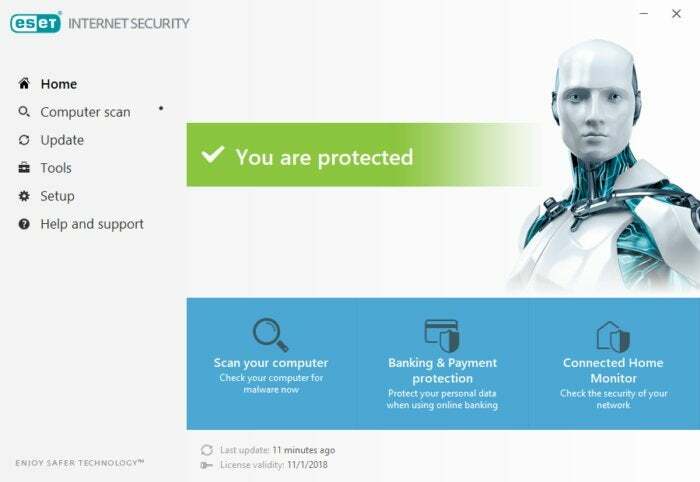 We reviewed ESET Internet Security a year ago in January 2018 as part of our round-up of the best antivirus suites and really liked it. The security suite also receives high marks from the independent testing firms AV-Test, AV-Comparatives, and SE Labs. EIS has everything you need to stay safe beyond a basic antivirus, including anti-ransomware, a webcam exploit monitor, a network monitoring feature that tries to stop threats spread through your home network, and an exploit blocker that scans commonly exploited apps. It’s also got a nice Connected Home Monitor feature that lets you see all the devices connected to your home network and any potential security problems they might have. Overall, it’s a great security suite and at $15 for three computers or Macs for a year, it’s available at a great price. If you need to beef up your PC’s security, don’t miss this deal. This story, "Protect three PCs or Macs with ESET's highly rated Internet Security suite for just $15" was originally published by PCWorld. Ian is an independent writer based in Israel who has never met a tech subject he didn't like. He primarily covers Windows, PC and gaming hardware, video and music streaming services, social networks, and browsers. When he's not covering the news he's working on how-to tips for PC users, or tuning his eGPU setup.